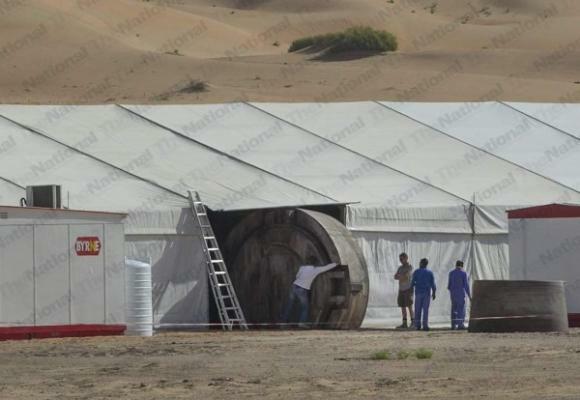 Are these the first set pics from Star Wars: Episode VII? These photos seem to be our first glimpse at the return of a long time ago in a galaxy far, far away. We've known for more than a year now that a new Star Wars film is on the way, and we've been hearing rumors and real reports about what to expect from it ever since. Lately, the Walt Disney Company has told us to expect production to start in May, while various other sources have told us to look for a production kickoff even sooner. Now via Abu Dhabi site The National, we've got these images purporting to be from the film's set "deep in the Abu Dhabi desert." Now, assuming that this is a picture from the Star Wars set (which hasn't been confirmed as of this writing), it's still a very vague image that raises more questions than it answers. For one thing, shooting in Abu Dhabi would seem to indicate the filming of scenes on the desert planet of Tatooine, though we've already heard reports that Morocco might be used as the new home of that world. For another, and perhaps more importantly, it's hard to tell clearly what exactly that big gray thing is in these images. Some have speculated that it's part of the escape pod (or a similar pod) that C-3PO and R2-D2 rode down to Tatooine in Star Wars way back in 1977, while others have theorized that it's the foot of an AT-AT Walker. Both of those theories could put the film firmly in flashback territory, but of course this could be neither of those things. It could be something brand-new. We'll see what else we can see of Star Wars: Episode VII, through the legendary veil of director J.J. Abrams' secrecy, in the coming weeks and months.